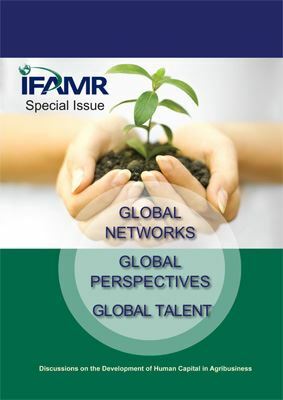 Since its founding, IFAMA has been successful due to the vision, hard work and creative efforts of a few key individuals. These individuals have distinguished themselves as leaders in the food and agribusiness industry as well as in service to IFAMA. This is the highest award given by IFAMA and is only awarded to members who have made outstanding and sustained contributions to the success of the organization. As China and other countries seek to secure a portion of their future food resources from other regions in the world, global relationships must expand and evolve. How will Chinese and foreign companies successfully cooperate in the future? China became the world’s second largest economy in 2010 and is poised to overtake the United States in 2030, if it can continue its move from export dependency to the development of an internal market. What opportunities and challenges come with this transition? Food Safety: A Threat or an Opportunity? This presentation will address food safety and security from a long-term supply and demand perspective. China has taken important steps to make food safety a priority, with the nation’s first food safety law taking effect in 2009. How can the opportunities be managed? Recent analyses indicate that approximately 1/3 of the food produced for human consumption is lost or wasted globally, which amounts to about 1.3 billion tons per year. Losses in Eastern and Southern Africa alone are valued at $1.6 billion USD per year, or about 13.5% of the total value of grain production. This presentation explores current knowledge regarding this issues and proposes way to effectively reduce loss in agribusiness food chains. The challenge of globalizing markets is nowhere greater than in the primary food sector. In China, safe food is no longer considered a luxury but a necessity. What is the current status of Good Agricultural Practices in China in meeting those global and domestic needs? Increasing purchasing power is revolutionizing food consumption patterns in terms of quality and quantity. What role does vertical integration and/or agroparks (e.g., vertical and horizontal integration of a number of value chains) play in delivering safe, high-quality, and eco-efficiently produced foods? Many technical innovations in agricultural and food systems are sparked by biotechnology. How does China look upon the role of agricultural bio-technology in ensuring adequate food security? What are some strategies the private sector can implement for a safer food supply. Can businesses maintain the trust of consumers? Western companies — with the specialties in equipment and expertise in management knowledge developed from years of compliance with stringent sustainability regulations — can export knowledge to assist their Chinese counterparts meet the rising levels of Chinese environmental laws and informed consumers. In this session two companies will present their business strategy linking food security and sustainability and share experiences with this strategy in China. With the rapid rise of China’s middle class and other global trends in food consumption, what will be the impact for the agricultural world? Since adopting market-based reforms 30 years ago, China’s ability to meet its food and agricultural needs has exceeded expectations. How has China succeeded? Will they meet current and future needs? What can other countries learn? China Investments Abroad: What Will it Look Like in 2020? To what extent is China looking overseas to ensure food security? What is China’s investment strategy abroad? Rapid economic developments have changed China’s position in the global food market. Not only in their share of the market, but also in their influence in that market. How will China’s position further change? Trade Liberalization: The Keys to Sustaining Growth? As the world’s largest agricultural economy and an important player in world agricultural markets, China’s role in international agricultural trade has implications for agricultural producers, consumers, and policymakers globally. What are the trends for the future? With China’s changing role their needs for new strategic alliances also changes. What characterizes these new strategic alliances? What types of global cooperation fit best with China’s need? Even as China has become more open to Western firms, many feel it still remains tricky territory to navigate. What are proven strategies to successfully start a business venture in China? In the last few years some Chinese businesses have transformed from rapidly expanding local players to dominant players in the world market. What does this development mean for the agribusiness community, and how will this influence global strategic alliance in the marketplace? All around the globe the future of the industry is determined by the quality and competencies of the people involved. Human capital development is a new rising star on the strategic agenda of agri-businesses. What are the opportunities and challenges? 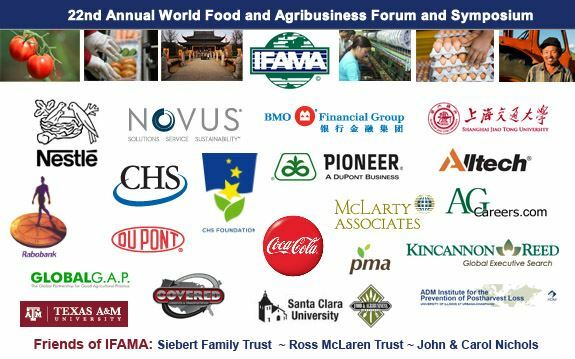 What role can IFAMA play?